The Pupunha palm tree is famous throughout the world for its supple inner fibres – known as palmito or “heart of palm,” a popular delicacy. For decades, this tree has been intensely harvested in Brazil and came close to extinction before tighter controls were recently enforced. 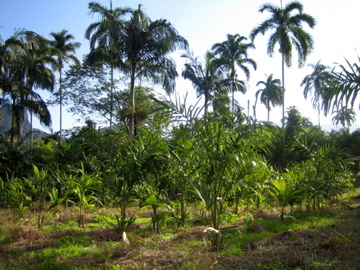 As only the palm’s core is usually of any value, after its extraction the tree’s branches, leaves and outer bark are often left rotting on the plantation ground. Determined to make use of such a wasteful process, Cláudio Ferreira,Fibra’s founding and former partner, first took the tree’s coarse, hard bark and, through a process inspired by the Asian technique of laminating bamboo, came up with Pupunha plywood. Dense, flexible and durable, this laminate was the first of Fibra’s natural, low-tech, low-energy consuming materials with which, for over five years, they’ve been turning farming by-products into resistant, high-quality wood alternatives. Fibra began developing sustainable materials and applications at Esdi – Brazil and Latin America’s oldest design school – first as students and later as graduates working at the school’s start-up incubator. As their business grew in size, orders and notoriety, they later left Esdi’s grounds and moved to a three-floor building in the centre of Rio de Janeiro. Today, it’s both in their studio, and on farms and forests across southeast Brazil, that Bruno Temer, Pedro Themoteo, Thiago Maia and Bernardo Ferracioli design materials, manufacturing processes and applications, with which they make the most of their natural and social surroundings. 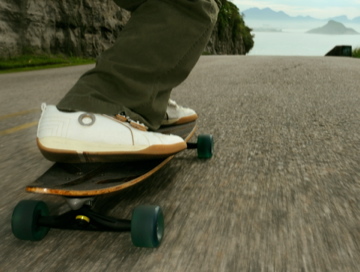 Such materials include Vegplac, which uses the inner and more delicate fibres of the Pupunha, and the organic bamboo laminate Fibra combines with layers of Pupunha to form Bioplac – the handsome composite their Folha Seca skateboard is made of. Bananaplac, a laminate made from banana tree fibres manufactured according to a process akin to artisanal paper, is produced in rudimentary yet efficient facilities that can be set up and maintained by banana plantation workers. Fibra’s sustainable values are expressed in their self-imposed, rigorous material standards, which include the use of natural, nontoxic adhesives and inks as well as detailed, “who gets what” price tags. Above all however, it’s their commitment to technology transferral and social development that matters most to them. Their manufacturing ethos follows the “teach a man to fish” dictum: Instead of developing a technique/material/product and selling it to a company that will open a factory and hire people to make it, they go to the often remote, destitute communities where a raw material is found and teach people how to essentially turn waste into an asset. Such thinking implies not distributing the made, but disseminating the making. With each material they make, they come up with their own design method: From sourcing raw materials to finding the right suppliers and funding partners, from artisan training to distribution or defining the end product’s right price. Driven by a work ethic that’s equal parts idealistic and pragmatic, Temer and his associates address their country’s natural wealth and the still unequal society they live in, which continues despite Brazil’s recent economic progress and increasing social mobility. More than “green materials,” these design solutions make a lasting impact on both ends of the industrial process: On one end, they provide additional income to the thousands, if not millions of Brazilians who depend solely on farming for their livelihood; on the other they make us, consumers, question what things are really worth. Such impact has given Fibra’s partners a great deal of awards and recognition, from the IF Material Gold Award that Pupunha plywood won in 2005, to Bananaplac being shown in several exhibitions, such as last year’s National Design Triennial in New York. Their work has also been widely covered in the Brazilian and international press. All this journalistic and curatorial enthusiasm did not however prevent, for example, Bananaplac from being discontinued. Genilda Morais, the handmade paper artisan with whom they began developing the material, lost interest in further investing in its manufacture. So while keeping an eye out for other potential Bananaplac suppliers or makers, Fibra’s associates moved on to other projects, not without reflecting on the often fragile complexity of their business ventures and alliances. Teeming up with other like-minded designers, companies and brands in Rio de Janiero and other parts of Brazil, Fibra have also been creating products that are not just applications for their materials, but are extensions of their design approach and, in a way, their “carioca” (native of Rio) lifestyle. Examples include an iPod dock and speaker designed by Casco Objetos, for which they provided the Pupunha plywood casing; a beach chair they designed for fashion label Richards; and a furniture line conceived in partnership with sustainable development NGO Instituto e and Meu Móvel de Madeira, a furniture manufacturer from southern Brazil. One of their most recent projects, RioMatéria, is material library aimed at the general public. Located in downtown Rio in a historic building – which it will share with Columbia University’s Studio-X – this library will allow people to freely look, touch and learn about new and old, natural and synthetic materials. A partnership between Fibra, Instituto e and Sistema Ambiental, this library wishes to raise awareness about the importance of materials for design, but also in our everyday lives. Something the partners of Fibra have been doing since their studio’s inception. Materials are the unsung heroes of 21st-century design. By making us reconsider where they come from, who makes them, how much they’re worth and even what they mean, Bruno, Thiago, Pedro and Bernardo are showing us the way to a better, brighter and fairer material future. This text was written for Design Indaba Magazine, after I tipped the organisers of Design Indaba, to invite Fibra Design Sustentável, in my view Brazil’s most inspiring design studio today, for their yearly the design event in Cape Town.